When I reviewed her debut novel, A Distant Melody, I noted that Ms. Sundin had set the bar so high, I was concerned she'd be able to match it with her second installment in the "Wings of Glory" series. I needn't have feared. A Memory Between Us excels on several planes. (No pun intended...well, okay, maybe it was a little bit intended.) The tale revolves around Major Jack Novak, a B-17 pilot (and brother of Walt Novak, our hero in Memory), and Lieutenant Ruth Dougherty, the nurse who tends to his wounds after a rather rude burst of Nazi flak grounds him. Jack notices the attractive Ruth through his morphine-induced stupor, but she has fended off the advances of so many male patients that she has a withering retort prepared before the first words are even out of his mouth. Imagine her surprise when he slurringly professes God's love for her instead of his own. Then he drops off to sleep. 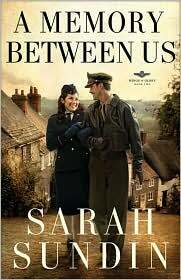 Thus begins the stutter-stopping relationship between a woman so emotionally incapacitated by guilt over a horrible childhood secret that she can barely function in a social setting, and a man so self-absorbed he can't figure out whether he's falling in love with the woman or just trying to charm her into falling in love with him. Enter a well developed supporting cast that includes the lovable May, who chips away at the wall around Ruth's heart, and stolid Charlie, who chips away at the pride around Jack's, and you've got a great recipe for an even greater storyline. Now for the author. As in Melody, Ms. Sundin delivers the raw grit and terror of WWII aerial warfare with all the skill of one who must surely have been there, seen that. She paints an equally vivid picture of the imperfect human heart as it trips along in all its glorious failings on the road to redemption. But another interesting facet of her writing surfaces in Memory that was only hinted at in Melody. In addition to adeptly portraying the gamut from heart-wrenching turmoil to heart-warming love, Ms. Sundin displays a unique versatility in that she can present the reader with a playful scene--yes, playful--without it coming across as trite or goofy. That's not as easy as it might sound. What do I mean? Shall I share an example or two? Sorry. Read the book. A Memory Between Us is a worthy sequel to A Distant Melody--and that's saying something. Thanks for a great read, Sarah. Can't wait for the third book!